This entry was posted on Monday, August 10th, 2015 at 3:12 pm. Did you all have a nice weekend? The weather here was pretty perfect – warm, but low humidity. I got to do all my favorite things this weekend: ride, read, work outside, and see my family. Saturday started out with a wonderful ride on Bailey. He’s finally starting to bend a little easier and doesn’t seem quite so stiff to the right. I have tentatively marked two shows on the calendar (one for September and one in October) – fingers crossed we’ll be ready for a little low-key walk/trot excitement! 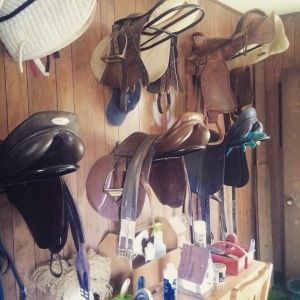 I snapped the below picture of my tack room, which I simply adore. It’s small, but orderly, and is just enough for me. James was off on Sunday, but I started out the morning with my favorite aunt and cousins. I met them for brunch (along with my mom and sister) to celebrate my cousin’s upcoming wedding – we called it a Bachelorette Brunch! The rest of the day was filled with yard work, grass cutting, and the driving range. And, of course, I made time to read! 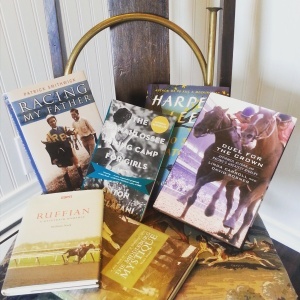 This picture shows (most) of the books on my summer reading list. I wish I could get paid to read books full-time!! Happy Monday!